Sci-fi inspired with an ultra-modern silhouette, the Kershaw Decibel will add volume to your everyday carry rotation. Comfortable, lightweight and edgy, this in-house designed manual folder features a reverse tanto style blade and sleek stainless handle. The Blade: Dual thumb studs allow easy access to the piercing reverse tanto styled blade. Composed of mid-grade stainless steel, the blade has been titanium-carbo-nitride coated adding a bit of extra visual appeal while also protecting the blade from corrosives. A bit of jimping along the thumb ramp provides traction for more demanding everyday slicing. The Handle: Also made of stainless steel with titanium-carbo-nitride coating to match the blade, the handle is slender yet comfortable. A large window cutout reduces weight while accenting the modern lines of the design overall. 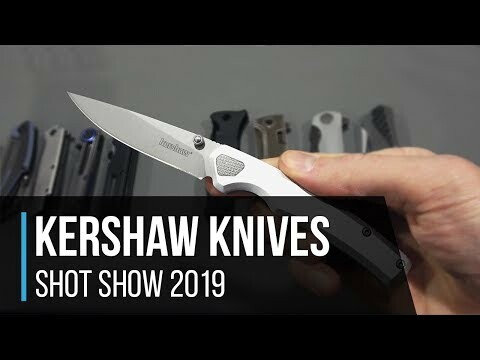 The Kershaw logo has been hidden in the cutout to maintain the sterile look of this folder. The backside of the handle features a stainless steel frame lock mechanism for sturdy and secure lock-up when you need it most. To complete the look, Kershaw added a vibrant blue pivot ring and matching backspacer. Reversible tip-up clip attached for convenient daily carry.